a explosive, if obscure, 45 rpm Blues/Gospel record called The Alabama Bus, a rhythmic chronicle of the Alabama Bus Boycott – which might be known as “spoken word” if recorded today. 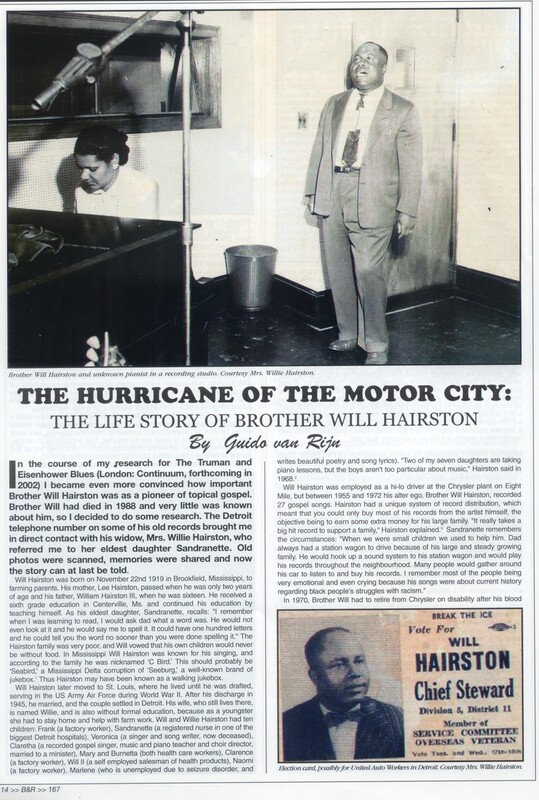 It was sung by Brother Will Hairston, a factory worker and preacher, who was called “The Hurricane of the Motor City”, due to his thunderous impact on a church services when preaching and singing. My father recorded Hairston’s iconic record in his Hastings street studio in the late 1950’s. This record is reportedly the first documented mention of Martin Luther King Jr. in any blues or gospel recording. I recently found this record and it had been 40 years, I’m sure, since last hearing my father play it over and over again in his record shop in the mid-sixties, and I remembered the chorus, hook and back beat as if I’d heard it the day before. I’ve written a piece about this record (below) in the November 10, 2010 Detroit Metro Times feature on little known local Detroit recordings/artists that deserved a wider audience. Back in the ’60s, my father [Joe Von Battle] played the record “Alabama Bus,” by Brother Will Hairston, in his 12th Street record shop, and I remember its “rat-a-tat-tat, rat-a-tat-tat” staccato (that was Washboard Willie in the backround). “Stop that Alabama Bus/ I don’t wanna to ride/ the Alabama boycott/ I don’t wanna ride.” My father played it because the record was a chronicle of the bus boycott in the South that he had fled, and because he had recorded it on one of his record labels, years before. “The Alabama Bus” is such a clear, anthemic narrative of the boycott that I always wondered, after I grew up, why it was so little-known. Brother Hairston was a Detroit preacher whose songs were startlingly socially conscious for the times. This record can only be found on an obscure compilation of Joe Von Battle’s recordings, or occasionally turns up on Ebay. To me, it is a masterpiece of the civil rights movement and a memento of my father’s bittersweet ties to the South. 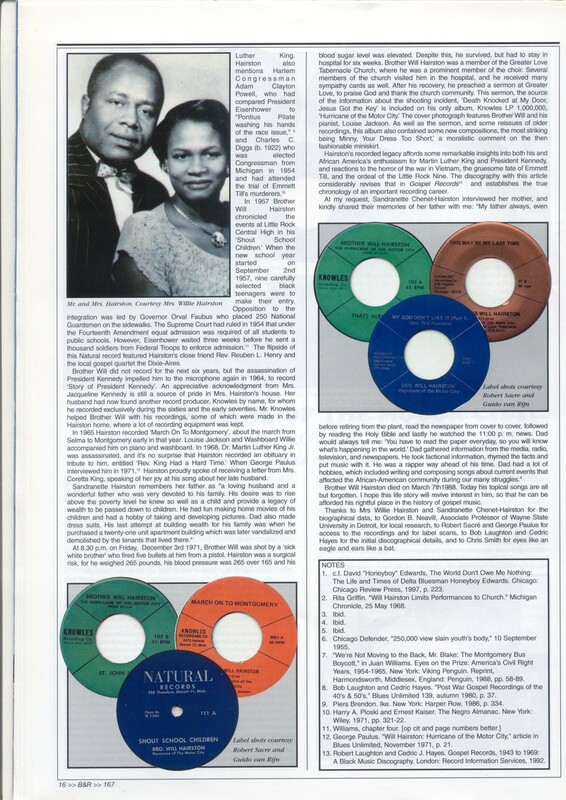 In mid-2009 I received a surprising and delightful communication from Dr. Guido van Rijn, a Blues and Gospel historian in The Netherlands who sent an astonishing gift – his scans (below) from a chapter of a book he had written, The Truman and Eisenhower Blues – African American Blues and Gospel Songs. It was the section about Brother Will Hairston. I was amazed that someone so far away had immersed himself in the arcana of an obscure Detroit gospel figure. Hopefully, more people will come to know about Brother Will Hairston and his extraordinary songs, especially, “The Alabama Bus”. 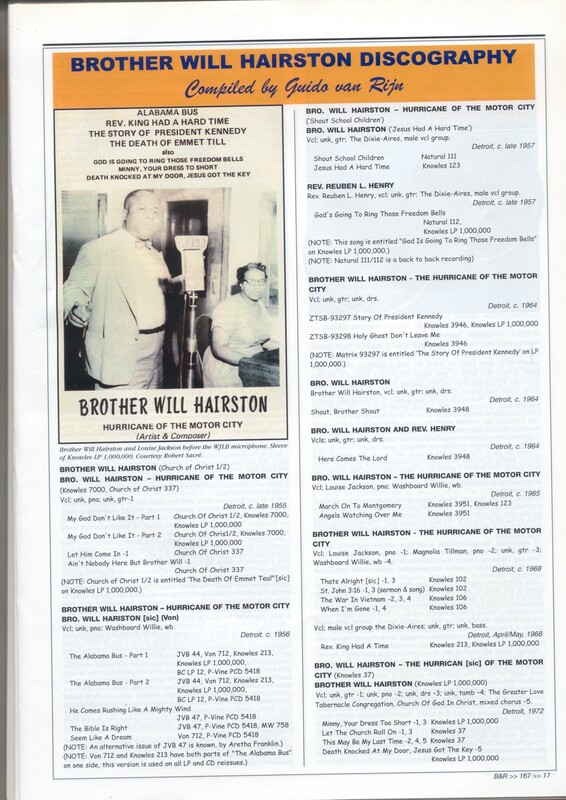 In honor of Brother Will Hairston, and his contribution to Civil Rights music history, and in recognition of my father’s foresight in recording him. Stop that Alabama bus, I don’t wanna ride (3x) Lord, an Alabam boycott, I don’t wanna ride. You know, they tell me that a human being stepped on board. You know, they tell me that the driver began to fuss. Chorus: Stop that Alabama Bus, I don’t wanna ride…. Well I am so shocked and HONORED that I’ve heard from you with your comments, and that you enjoyed my writing about your father. I remember listening to The Alabama Bus back in the day, my father always wanted me to play it on the turntable of his record shop on 12th Street. I was young and didnt’ really understand the meaning of it. Now I know that it was an historic recording. I thank you for reading this and for your kind words, and I will be contacting you by email. Marshamusic, thanks for responding I can’t wait to hear from you. My mom told me to tell you that she apperciate all the wonderful things you said about her late husband (Bro. Will Hairston) my father it’s so much to tell and do. I’ll be waiting to hear from you. Gabriel usually points out the male substitution for Rosa Parks inherent in the song, but didn’t in this case. Oh my Goodness!! What a surprise to get your note and to hear that clip! This is wonderful! I certainly hope that lovers of Bro. Will Hairston hear this, and especially that any of his children who might be reading this hear his voice as well. To Ms. Marlene Hairston, I’ve tried to contact you but have been unable to reach you by email. Please send another comment with your contact info (I won’t post it, of course) and I’ll try again. It’s tempting to call in to Gabriel’s show and request that he play that recording of BWH speaking… on the recording I posted, it sounds like he might have cut it off before it’s over. And who knows what else he may have up his sleeve? Gabriel has a remarkable collection of music. Do you know (or does anyone know) about the line: “…in the second World War my father lost his sight” — is he singing as MLK there (about MLK’s father) or is that a reference to his own father? The driving, intense, ceaseless vibe of this song is so perfect for the subject matter. Well CC, those are some kind words. I do think my father’s story is cinematic, epic in scope as they say in Hollywood. Hopefully my story will find it’s way to a screen. I don’t know why the song isn’t better known, why it hasn’t for example, been used in documentaries on the period etc. I don’t think the gender issue explains it, that’s easily handled with editing. (CC, is referring to, Bro. Hairston’s describing the Alabama Bus Boycott, but saying the hero who wouldn’t move from the back of the bus is a “he”, instead of, of course, “she”, Rosa Parks. I have no idea why he constructed the story this way. It doesn’t have to be a reluctance to acknowledge a woman’s role. It might also be his desire to acknowledge others who played unknown, unsung roles in the movement that might have been just as pivotal. I don’t now, either, what is the meaning of his reference to blindness. There are many mysteries to this song! I agree with you about the “vibe” – I had not heard this song in 40 years, yet I remembered it as if I had heard it every day, that rhythm – by Washboard Willie – always stayed with me. Thanks for reading and sharing your thoughts! check in with me again! Re: the gender change; yeah, it seems like it must have been an intentional choice. Hard to imagine someone in 1956, let alone today, not knowing it was Rosa Parks. And re: the blindness; just read up on MLK Sr., doesn’t sound like he was the one, especially given the timing, so perhaps it was Bro. Hairston’s father or just a poetic invention. You are living history about music in Detroit before Motown. You’ve soaked up what was going on around you as your Father recorded so many musicians. I’m glad that you are sharing your knowledge. Plus look what you’re already reaping- you’re now in touch with members of his family. Thank you for your insight and encouragement. It is high praise from you, an author whom I greatly admire (readers, check out her book, House Home, a lovely memoir of growing up in Georgia). I found your information a blessing. Information I had sought for many years. It answered so many questions except one. I think it is important, if not historical. Maybe thswill benefit us both, as well as so many others. Your reply will be crucial. In your histology, you mention The Alabama Bus was on a 45 rpm record. Please hold your hat.. I have 2 78 rpm records of The Alabama Bus. 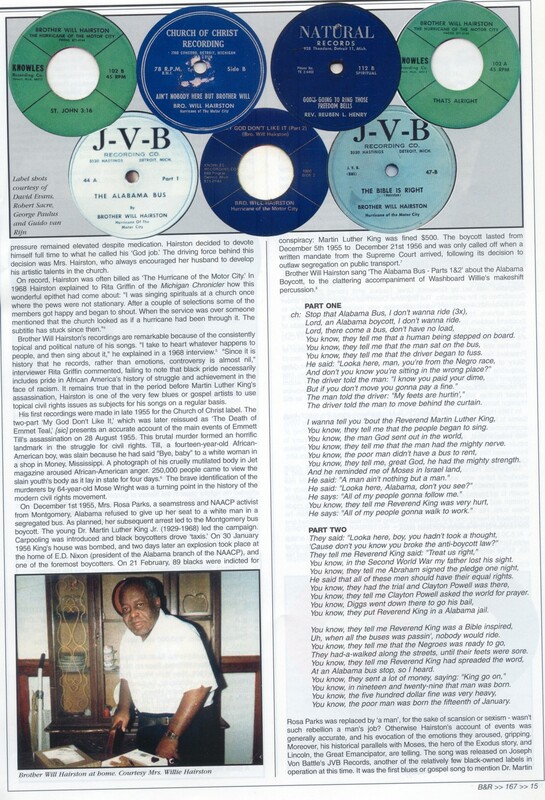 J-V-B Recording Co., 2530 Hastings, Detroit Mich. 44Apaet 1 and 44B part 2. I consider this very unusual. since 78s had been replaced by 45s, way longer than this. Can you shed some light on this, not only for myself, but for the world? We are taling about an importany piece of history. Please let us all know. On behalf of everyone, I thank you. I look forward to ant replies for the sake of history. Sorry for my late feedback on your question Bob; yes, it would appear that a ’78 would be unusual, but I have no idea about it’s production. Perhaps I can ask a few questions about it and give you some feedback. I agree that would be quite a find, if not for the sake of history, at least for record collectors’ sake. WOw I was surprised to see this article about my grandfather and the wonderful things people have to say about him. He passed away when I was 7 years old but I have fond memories of him when I was a kid. My grandmother (his wife) passed away November 19th 2012. Best wishes! Where are your cntact details though? I would guess that more copies were pressed of the 78 than the 45? Did Von Battle leave any written records of his recording activities at all?? Chris, as I indicated, his business was destroyed in the 67 Riots, and what little remained has been lost. You can find me on facebook – Marsha Music. Craig, thank you for your comment. It IS an amazing song. Thanks for the link, I’ll also post it in the body of the story. Is there any way to purchase and download this album as an mp3 file? Yes, its a very good record, and apropo today. Thanks! I’ll check it out….